Where are the Bulls after 10 games? By Sam Smith | 11.18.2015 | 11:45 a.m. So who are these Bulls through 10 games with a new coach, a new starting lineup, pretty decent health, an expanded rotation, a mandate to play a faster, more open game and with a 7-3 record? 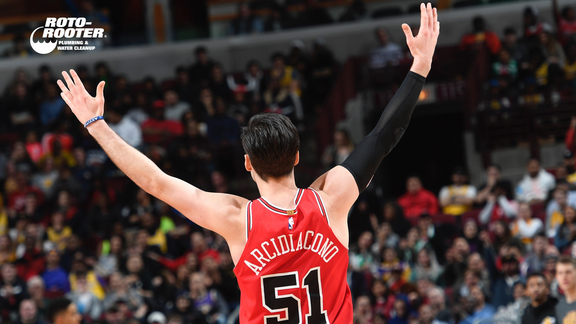 For one thing, the Bulls probably are not the team that the statistics suggest is headed for 57 wins, which would equal the current 70 percent winning percentage. There are dozens of statistics to make a case for a team these days. But one of the most proven over the history of the NBA is point differential, the amount of points you score compared with the amount of points you give up. Because, simply, the games are decided by actual points instead of statistical trends. The most successful teams in NBA history, the 1995-96 Bulls and 1971-72 Lakers, had the greatest margin of victory, both about 12.3 points per game. The following season in 1996-97 when the Bulls matched the Lakers with 69 wins, the Bulls were at just under 11 per game. But that was mostly because they lost three of their last four in easing into the playoffs. It’s early, as the refrain goes in November. But this current Golden State Warriors team, whom the Bulls play Friday after facing the Phoenix Suns 9:30 p.m. Wednesday on WGN and ESPN, had a winning margin of 16.3 points per game before defeating Toronto Tuesday. That translates to about 76 wins. So we’ll give them the big qualifier that it is just over 10 percent of the season thus far. The Bulls margin of victory ranks 12th in the NBA at plus 1.9 points per game. That translates to about 45 or 46 wins. Last season, the team ranking 12th in margin of victory was the Oklahoma City Thunder at 2.2 per game. They won 45 games. Of course, with so few games thus far that measure can be overly influenced early by a blowout game, like the Bulls 25-point loss to Charlotte. It’s obviously a different kind of season for the Bulls because of the way coach Fred Hoiberg is approaching the challenge. Joakim Noah has joined the reserves with Nikola Mirotic starting, the theory being to spread the court for three-point shooting and more open driving lanes for Derrick Rose and Jimmy Butler. Plus, Hoiberg has dug deeper into the bench, regularly using 10 players in the rotation for the first significant playing time for Doug McDermott and E’Twaun Moore. In addition, Hoiberg has alternated starting McDermott and Tony Snell with Mike Dunleavy out until December after back surgery. Also, Rose, who is listed as doubtful to play in Phoenix Wednesday after an ankle sprain in the win over Indiana Monday, basically missed all of training camp after an eye injury in the first practice. So it’s been both a personnel juggling act and a feeling out process for the new coach with the goal being to improve during the season and build toward the playoffs with fewer minutes for players until later in the season. Thus is makes sense to give Rose time to heal even though the sprain is considered minor. Kirk Hinrich could start for Rose Wednesday since Hinrich lately after his return from a toe injury has been the first guard in for Rose. The Suns have a dynamic offensive backcourt with Eric Bledsoe and Brandon Knight. Perhaps the Bulls play a smaller lineup, which the Suns do with Tyson Chandler at center. Moore should get ample playing time as well. The conventional wisdom with this Bulls team this season is it’s been a poor defensive team with the addition of Mirotic as a starter and occasionally McDermott, and with Pau Gasol starting and Noah playing fewer minutes off the bench. But the Bulls are first in the NBA in opponent field goal percentage at 40.8 percent; that’s the metric former Bulls coach Tom Thibodeau most prized for his team’s defense. Where the Bulls have not advanced as much is on offense. They are 21st overall in shooting at 43 percent. They are fifth, however, in three-point shooting at 37.3 percent thanks to the shooting of McDermott, who leads the NBA in three-point shooting at 56.8 percent. But the Bulls’ three-point defense doesn’t match their overall play as they’re 18th. And, surprisingly, they are averaging just one more three point attempt per game than last season. They rest about in the middle of the league in three-point attempts. Though that’s principally because the guards, Rose and Butler, are not top three-point shooters. Rose is just 15 percent because of his eye problems, but has just 20 attempts. Butler is 37 percent. The Bulls also are missing their best three-point shooter from last season, Dunleavy. The Bulls’ shaky shooting this season also has been at the free throw line, where they are 19th. The overall rebounding generally is good with the Bulls fourth overall at 47.5 per game. But probably because of the starting lineup change with Mirotic and Snell or McDermott on the front line to start, the Bulls are among the league’s poorest offensive rebounding teams. Thus they are a negative in overall rebounding at minus 2.4 per game with opponents averaging about 40 rebounds per game against them. It’s a vital area to upgrade. That likely has a lot to do with Noah coming off the bench with Mirotic starting, though as yet it hasn’t translated into substantially better offense. The Bulls do play faster as their pace of play is tied for 11th in the league at 100.6 possessions per game. Last season, the pace was 20th at 95.4. But the Bulls overall offensive efficiency of points scored per 100 possessions ranks tied for 24th at 98.4. The defensive efficiency is tied for fifth in the league thanks to the low opponent field goal percentage that ranks best in the league. The Bulls true shooting percentage using the ESPN statistics before Tuesday’s games including free throws and threes ranks about in the middle of the league. Though turnovers were an issue early in the season, it’s being careful with the ball that has saved the Bulls overall. The Bulls are seventh in committing turnovers, though just 28th in forcing turnovers. Though their differential is sixth best in the league, which is excellent. But even with Butler being 13th in the league in steals, the Bulls are among the league’s poorest teams in steals, ranking 27th. It’s a factor of a general lack of athletic players at the wing positions. The Bulls are third in blocks thanks to their size in the front court and 10th in assists. So they’re unselfish, but a bit slow to react. So where are the Bulls after 10 games? Well, other than in Phoenix. The defense is better than expected, but they probably need to get better shots. Which, presumably, will come if they can play a bit faster. Currently, the Bulls still go through regular streaks in games of individual play without the player and ball movement that Hoiberg has been advocating. Fundamentally, they haven’t been as sound with lack of positioning in rebounding. They move the ball well and try to be unselfish, though not quickly enough throughout the game. That, presumably, would compensate some for the lack of athleticism at some positions. Rose has looked to facilitate more this season and as he recovers from his ankle injury, eye surgery and missing training camp the offensive flow and passing should improve. The Bulls still hesitate getting out of the backcourt and passing ahead, accounting for the offensive efficiency regressing, the shooting down and the three-point attempts not much improved. The theory is speed will equal better shots and thus improved percentages. Overall, the percentage of missed shots leading to rebounds also has regressed in the name of offense that is famously the work in progress. The defense is good enough. The rebounding could use some improvement through effort and fundamentals like boxing out. This group is going to get beaten some with its overall lack of great athletes. They’re not forcing things or particularly careless, though they probably could work harder. They are skilled and should shoot and score better. It’s just not there yet. The good news? There’s a long way to go.